A while back, I mentioned that the uncrystallized candied ginger from Trader Joe’s is a current favorite of mine. I really prefer it to the more common crystallized candied ginger, because it doesn’t have all that extra sugar on it. I add a small piece of ginger to most of my green drinks for a little added zip. I even put it in this beet-apple-carrot whole food juice. It adds a nice little kick of spice to just about any blended concoction. Ginger is an amazing spice. It has powerful anti-inflammatory effects, can help soothe an upset tummy, cure a cough or a sore through, and even help treat a headache. Here is a great article that talks about the many benefits of ginger, including many studies that have shown that ginger consumption can help prevent and treat cancer. These ginger Lara Bars were inspired by a friend of mine that lives in Bend, OR. 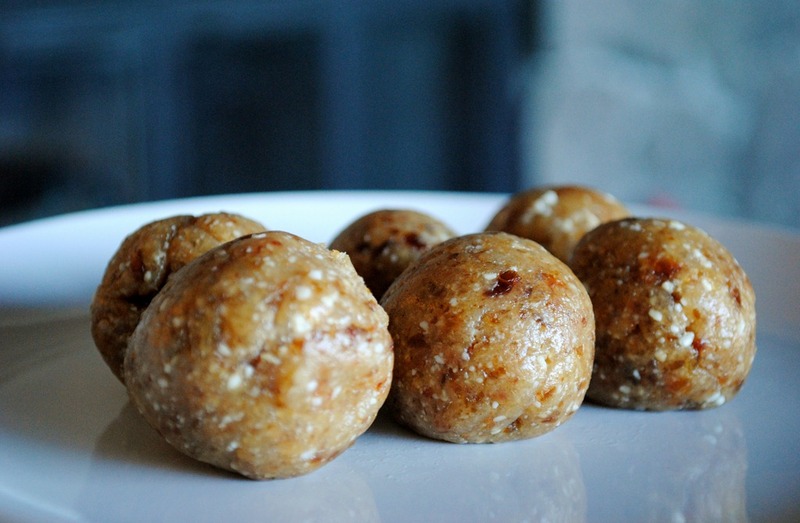 She told me she took my basic Lara Bar recipe, used the Trader Joe’s uncrystallized candied ginger with it , and rolled into balls instead of bars. So, you know I had to recreate these for you! 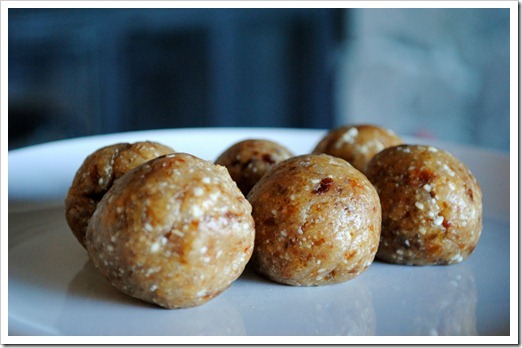 You can make them as bars or, roll them into balls for a convenient backpack-worthy snack. It took me three tries to get this right, even though I know the exact formula that works is: 1/4 cup nuts, 1/4 cup dried fruit, and 6 Medjool dates. I am always messing with recipes, and tried Deglet Noor dates (came together, but weren’t quite as “smooth), double nuts (too “nutty”), and finally, with the tried and true recipe. Just goes to show you not to mess with a good thing! Medjool dates are the important ingredient here, as they are the binder. I tried making these with Deglet Noor dates, and they don’t come together as well. Add dates to the blender jar, and pulse to combine, then, blend on “2” for about 30 seconds to combine, and then begin pulsing until the mixture comes together in a “blob” (or several blobs). This may take quite a bit of pulsing, but it will come together. Pinch off small sections at a time from the “blob” – roughly 1 inch by 1 inch – and roll into balls with slightly damp hands. These do not need to be refrigerated, but the fridge keeps them nice and firm.